Swan deluxe cruise 2 days 1 night holiday will be the best choice for your exploration of the dragon bay in a limited schedule time. 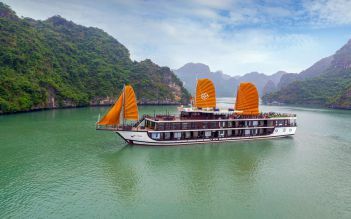 Boarding on Swan 3-star Halong cruises, you have chance to discover thousands of cliff Stone Island rising from the crystal waters, long sandy beaches, amazing grottoes, and lagoons alternate with authentic fishing culture. 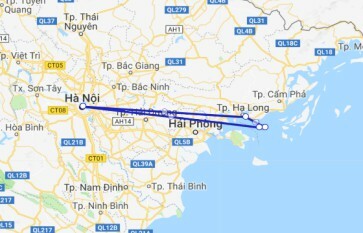 07.45 – 8:30: Optional Swan shutter bus will pick you up from your hotel in Hanoi and heading to the northeast of Vietnam. At the middle of the way, we have a quick stop to stretch your leg and refresh then continue our way to Halong Bay. 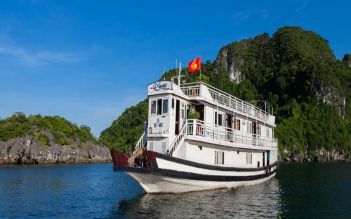 12.00: Arrive at Swan office in Ha Long, have a bit time to relax, and then you will transfer to Swan Cruises by tender. 12.45: Enjoy welcome drink, be briefing about safety on board and activities included then check in your cabin. 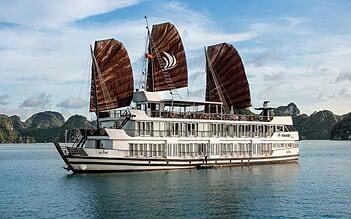 13.30: Have lunch while leisurely cruising to the core of Bai Tu Long Bay. 15.30: Arrive in Cap La Island - the beautiful area in Bai Tu Long bay. Enjoy kayaking through the karsts and breathtaking nature, and relaxing on beaches. 17.30: Get back to the boat and enjoy Sunset Time( enjoy tea and fresh fruits). This time is regarded as “ Happy Hour” while our cruise is sailing to the overnight anchorage. In addition, Cooking class is also organized by our guide at this time. You have a chance to make Vietnamese cuisine by yourself. 19.00: Have dinner in the dining room on board. 20.30: Free time for joining Games, you may also try your luck with squid fishing. If you want to sing karaoke, please inform our tour guide to be supported. 06.30: Start your day with Tai Chi on the Sundeck. Enjoy early morning landscape of the bay. 08.45: Return to the main boat. 09.30: Finish packing and check out your cabin. (Please remove all of your belongings from your cabin, you may leave heavy luggage outside of the cabin (our staff will support you transfer directly to the pier). 10.00: Join in and show your creativity in fruit carving activity. 10.45: Enjoy lunch while our cruise is returning Hon Gai harbour. 12.00: Back to the harbor and disembark in Hon Gai pier. 12.30: Farewell Halong Bay then our bus will take you back to Hanoi. 17.30: End of 2-day-1-night trip on Swan Cruises. Où la luna Halong bay trip with swan cruiser and Luna was amazing ! So smiling people and funny. The trip was really nice and I recommend hundred pourcent Thank you ! 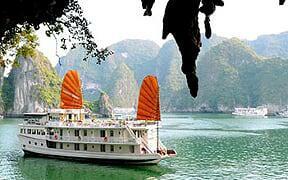 The hard wotking crew on Swan Cruises make it possible for guests to experience the sublime beauty of Halong Bay. I personally did not enjoy all the planned activities and i am probably in the minority to comment that the food was bland. But my purpose to experience a phenomenal natural setting overshadows any negatives. David is an excellent guide who exhibited great care in meeting passenger needs. 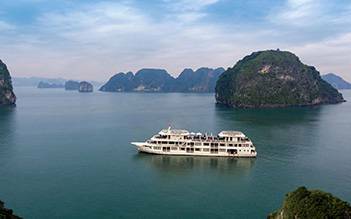 We have a wonderful memory of Ha Long Bay, especially with our tour guide, Daisy. She is efficient, helpful in all ways. But I need to stress that she speak English very well, making our trip so much easier. The whole team was fantastic in its own was, making us so comfortable n happy. We had the 2D 1N cruise and David was our tour guide. Funny, helpful, enthusiastic and such a nice guy. We learned a lot from him as well. We had such a wonderful time with him. The crew was very nice as well. Food was great. The whole experience was awesome!